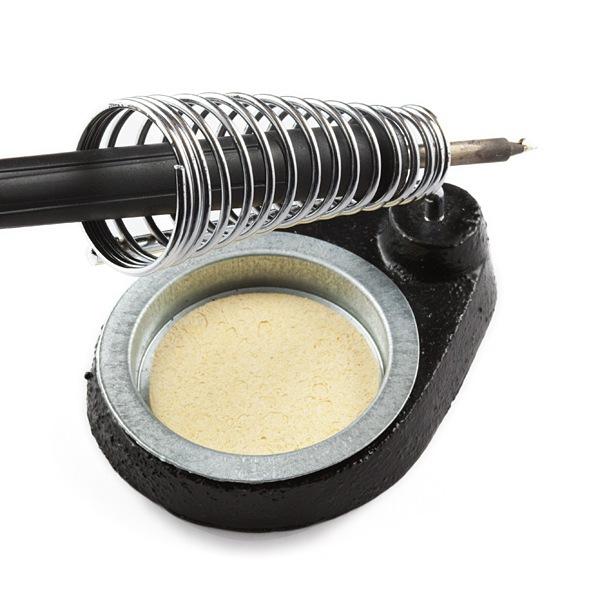 This is a simple soldering iron stand composed of a heavy-duty metal base and a reinforced spring holder. The base and holder are detachable. A circular cleaning sponge, which has a nice home at the bottom of the base, is included. 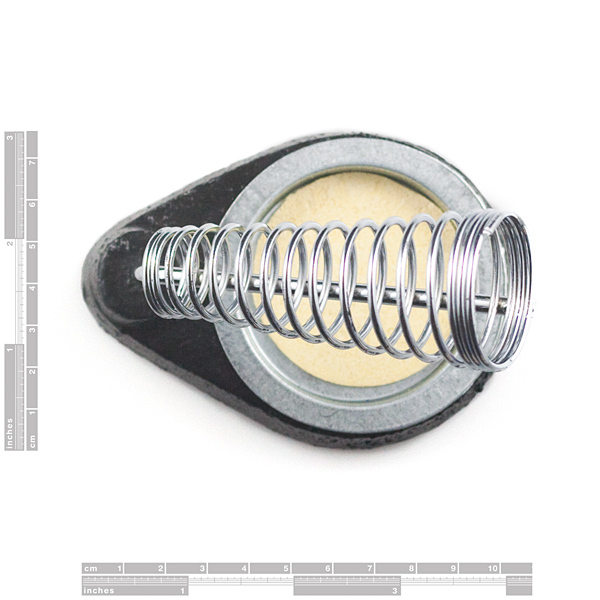 This holder should fit most soldering irons, and it's a great way to keep our 'fire-starter' handy and off your floor. I definitely can't recommend this stand at all. I purchased the yellow 30W Solder Iron from Spark Fun along with this stand. The iron fit in the coil awkwardly, and the entire stand would bend and buck if I moved the power cable just a little bit. I was constantly paranoid that this would tip off my workstation. After one soldering session, the entire coil fell off the metal post. It just...fell off. Good thing my solder iron was cool. Next time I'm going to pay more for a quality solder iron stand. I agree, you can't trust this thing, it can barely keep the iron in place. A complete piece of rubbish. Does not fit your 30 watt iron, frequently tips over, etc. Its dangerous. You should not be selling this. SF, this thing has a very bad review and only negative comments. Time to replace it with something more sturdy? I can also attest to the low quality of this stand. Came in a cheap white box with chinese characters all over, the sponge is thin, tears easily, and barely holds any water. Get the brass sponge, this works fine with it and you'll never forget to wet it and burn it. Also, the coil is thin and springy, only attached to the post on each end, and I am afraid of popping it off. The base, though heavy and fairly stable, is cheap cast iron, rough to the touch and ugly. Overall, it felt like it was thrown together for as little as possible, and will fall apart if you touch it. Get a better stand. Also, the sponge holder slides back and forth. Not a big problem, but definitely annoying. I definitely don't recommend this. It came with my simon says PTH soldering kit. After taking it out of the box, the joint connecting the spring to the main support wire just broke. I was able to secure it with a twist-tie (just the metal to avoid the paper catching fire with the iron). When I placed the iron on the stand, it just BARELY manages to balance on the front, where the sponge is. This stand does not have enough weight to it to support an iron on its own. If you don't have something to bolt this down to (there is a screw hole on the bottom), then don't get this. I nearly burned myself many times thinking that the iron was about to fall off of my table. I actually like this stand, and I use it with the 30w iron sold here. By itself, the stand doesn't stay put when using a soldering iron that has a thick cord as the comments suggest. The solution is to screw this to a board (one screw through the sponge holder). I used a 6" piece of a 2x6. With the extra room on the board I used a hole saw to recess a spot for my flux can, and I put in two long screws to hold a spool of solder and some electrical tape. This makes for a cheap soldering station. Can you remove the sponge holder to fit a brass sponge? Why yes, I would like to burn my desk! The spring iron holder on this stand is fine. It's long enough to hold most irons, and has stood up with heavy use. Now, the base... it isn't heavy enough to balance any but the tiniest iron. Sparkfun doesn't sell tiny irons, they sell normal irons. Put the normal iron in the stand, stand falls over. Repeat. You will burn something, probably your desk and maybe your hand. The sponge is also terrible, but you should be using a brass sponge anyway. I modified mine with some lead wire to keep it from falling over, but it still wobbles. Spend $10 and get something better. 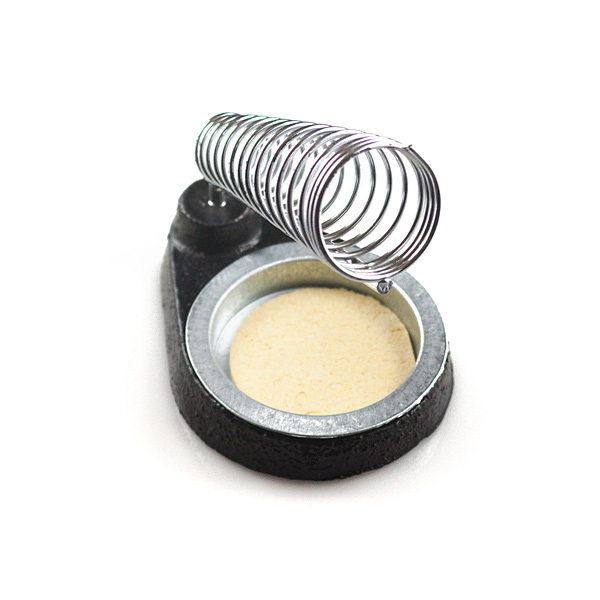 This product is completely unsuitable for use as a soldering iron stand. It is not nearly heavy enough to support a soldering iron plus power cord. In the brief period before I gave up on it, it tipped over twice, once managing to dump the hot soldering iron onto the floor. This couldn't even be used as a tacky desk ornament. The splinters of metal and razor sharp edges on the poorly manufactured base would cause enough of a hazard on their own. One star because I can't give it zero, and the impressively cheap sponge it comes with does, in fact, hold water. Barely. The thing about good and cheap is that it isn't perfect. It holds my small iron well. It wouldn't likely hold a gun or larger iron. I threw the cheap sponge away and just used my brass wool cleaner instead.